Tacoma, WA – At least 120 detained migrants in four units at the Northwest Detention Center (NWDC) have begun a hunger strike to protest the abuses they face inside the facility, which is owned and operated by GEO Group, a private prison company, for Immigration and Customs Enforcement. The strike comes at the heels of a work stoppage on Wednesday February 7th by detained people who work in the kitchen and just days after NWDC Resistance held a People’s Tribunal in front of the NWDC. Leaders of the strike report continued inhumane conditions and abuse at NWDC. Strikers are demanding GEO Group provide edible, nutritious food and emphasized the egregiousness of GEO’s practices by saying “food has gotten so bad it makes people sick. 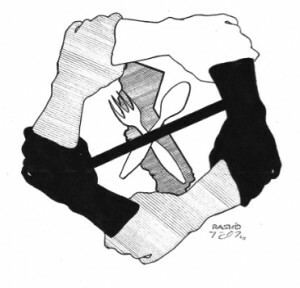 Food served in the hole [solitary confinement] is hardly enough, as we received smaller portions than people in general population.” The use of isolation, particularly as a form of retaliation, is a prevalent issue at NWDC. Strikers have also reported that GEO guards constantly search the beds and units of detained people without reason nor explanation and demand an end to these searches. In addition, strikers demand ICE provide fair hearings and lower bonds, particularly in light of recent bond amounts as high as $35,000. This contributes to ICE’s practices of indefinite and prolonged detention, as do excessively long delays in carrying out deportation orders. Together, these have the effect of keeping people incarcerated and growing GEO’s profits. This is from the SF BayView, July 7th 2014. 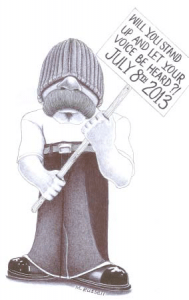 One year ago, on July 8, 2013, 30,000 California prisoners initiated the largest hunger strike the world has ever seen. Sixty days later, 40 prisoners, who had eaten nothing in all that time, agreed to suspend the strike when state legislators promised to hold hearings on ending solitary confinement, the heart of their demands. The 2013 hunger strike followed two in 2011 in which participation peaked at 6,600 and 12,000. In the interim, effective October 2012, the hunger strike leaders, representing all racial groups, issued the historic Agreement to End Hostilities, which has held with few exceptions throughout the California prison system ever since. These statements, most by hunger strike participants, arrived in time for the July 8 anniversary, and more will be added as they arrive. Our unity is our strength. If we learn to cultivate our unity, we can begin to reshape this world – back into a world that reflects our humanity – because there is too much pain and suffering in the world today that only our unity will end. We’ve got to be unapologetic and always be dedicated and serious about the revolutionary change we seek. Violence only perpetuates more violence inside of the vortex of violence, the senseless taking of lives, like a timeless hour clock that never ends, feeding on the very lives of our families and friends. An end to all hostilities means peace amongst the oppressed, where our children can focus on school and living their lives peacefully, while they develop into strong young men and women. An end to all hostilities means peace for the elderly and worrisome minds, where they can take peaceful walks during any time of day or night, sit out on their porches and watch the moon and stars in the sky. An end to all hostilities means peace where young men and women can go into any neighborhood to socialize with fellow human beings without fear of being attacked or murdered. An end to all hostilities means peace where all races in the free society can coexist without worrying that their race or class will be a hazard to them. During our strikes to end all hostilities – July 1 to July 20, 2011; Sept. 26 to Oct. 14, 2011; and July 8 to Sept. 4, 2013 – we men and women got together and said enough already! An end to all hostilities is solidarity. Send our brother some love and light: Mutope Duguma, s/n James Crawford, D-05996, PBSP SHU, P.O. Box 7500, Crescent City, CA 95532. It has been three years since the commencement of the first hunger strike. As I look back over that time to weigh our sacrifices against our successes, I have to admit that the accomplishments we’ve achieved thus far do allow me to be somewhat optimistic about the future. I cannot help, however, but remain angered at the cost of human life and damaged health we suffered simply to enact change – the price was way too high! And, although our accomplishments appear promising, in no way am I suggesting that we’ve succeeded in our overall struggle, which is to end long term solitary confinement and to better the living conditions of all SHU facilities – we are on our path, though! As always, it’s of the upmost importance to acknowledge family and friends on the outside, who through your unwavering support have made it possible for us to be who we are today. Each of you, through your contributions and sacrifices, be they personal or collective, have helped pave the way for this struggle to move forward. And we on the inside will forever be grateful! 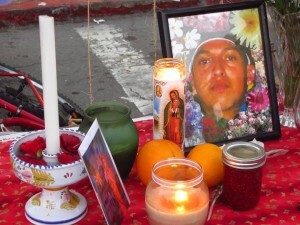 Send our brother some love and light: Antonio Guillen, P-81948, PBSP SHU, P.O. Box 7500, Crescent City, CA 95532. July 8th is a date that made history around the world last year – 30,000 prisoners began a hunger strike in the state of California due to the inhumane conditions of solitary confinement. The strike did not come about as a spur of the moment idea. No, these inhumane conditions have been worsening year after year, decade after decade until the outside and inside finally joined together in a movement for change. The change started on July 1, 2011, and Sept. 26 of the same year, which set the course for the Big One – the one that got the attention of the world to show how prisoners are being treated, not only in California, but in most states of this country. Speaking as one of the four main representatives for the prisoners in the Pelican Bay SHU, I applaud us all, prisoners and advocates alike, those who participated in the hunger strike and worked so hard for our case. Looking back on this year, I see progress being made toward closing these holes – not as fast as we’d like, but the crack has been formed. The light is now beginning to seep in upon these dark, dreary walls for once. In order to widen the crack until these walls come crashing down, we need to work together to keep the pressure on and on. We, as prisoners inside these places, have been advocating an end to hostilities among us. This attitude, along with the continued help and support of you good folks out there, will hopefully bring about a more civilized society and for us to live in peace and harmony. 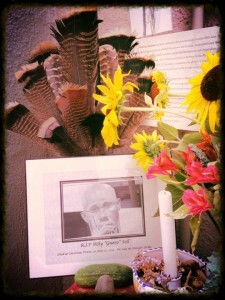 Send our brother some love and light: Phil Fortman, B-03557, PBSP SHU, P.O. Box 7500, Crescent City, CA 95532. Solitary is torture. It humiliated me. They strip you of everything – I was only given a mumu and half a mattress. You are locked away with no answer. I was cold, tired and hungry. The other ladies in Ad Seg helped me out and also the ones on Death Row, which is right nearby, gave me stuff to survive. The hunger strike last year was amazing. The guys went through hell, but it was so good for them to come together! Send our sister some love and light: Alicia Zaragoza, X-07564, CCWF, P.O. Box 1508, Chowchilla, CA 93610. Solitary confinement in all ways is cruel. If it is a form of abuse to keep a child locked away in a closet for long periods of time, then why is it not abuse to keep that same child, who is now a man, locked in a cell for years? Put yourself in their shoes! I supported the hunger strike. Send our sister some love and light: Natalie De Mola, X-12907, CCWF, P.O. Box 1508, Chowchilla, CA 93610. For a little over a year I’ve had the great good fortune to be a participant in the Prisoner Hunger Strike Solidarity (PHSS) coalition’s Human Rights Pen Pal program. Through this program I’ve been corresponding with several activists inside the SHUs, including several in the New Afrikan Revolutionary Nationalist Think Tanks. It’s changed my outlook on life in a big way, to say the least. As a hunger strike supporter on the outside (since 2011) who has never been incarcerated, I had very little understanding of the ongoing cruelty, dehumanization and torture that goes on in the California prison system. I know I will never fully understand what it means to endure that – unless I’m forced to – and I’m still regularly shocked when I hear of new and different atrocities from both incarcerated people and prison survivors. What I do know is how much respect and admiration I have for the people I write to, the organizers and participants in the peaceful protests, whose very bodies are the battlefield – and who have the strength and strategic intelligence to meet the oppressors on that battlefield with a series of hunger strikes.